The charger is run from DC power. It accepts 11-15V DC, so it’s designed to run of a car battery or an equivalent power supply. Make sure your power supply can provide enough power! I used an 28A 13.8V switched-mode power supply. It supports charging at up to 5A or 50W (whichever limit is reached first) per charger, which isn’t particularly fast. 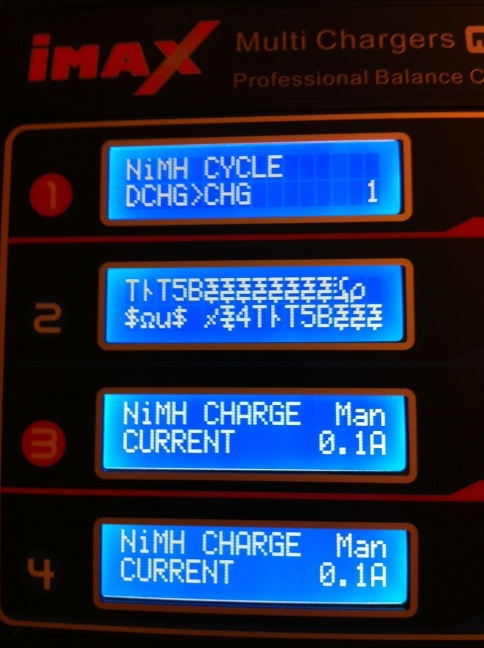 However, this isn’t particularly important when charging Lithium-based batteries. These require a CC-CV charging process: batteries are charged with a constant current (CC-phase) until they reach 4.2V/cell. After that, the charger switches to constant voltage (CV-phase) and maintains that 4.2V/cell by decreasing the charge current. When the charge current reaches 0 (or practically, 2% of the original charge current), the battery is considered full. This means that the CV-phase will always take the same amount of time, independent of the charge current during the CC-phase. This graph suggests that the CV-phase takes ~24 minutes. The input side consists of two 4mm “banana” bullet connectors which plug right in to most power supplies. They also provide clamps, so you can clamp on to a car battery. The side of the batteries has 4 pairs of 4mm sockets. The included accessories include conversions to crocodile clips, male Tamiya connector, female Futaba connector and female JST/BEC connector. The balance connections are unkeyed and spaced 2.54mm (0.1″) apart, so you can plug JST-XH connectors straight into the charger. The box also provided a board that receive 2S-6S FP/TP, and a second board that receives 2S-6S JST-XH. The charger also supports a computer interface. To be honest, it was a bit of a disappointment. 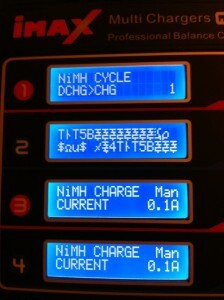 For one I expected to be able to get detailed voltage/current from all 4 chargers simultaneously. Turns out that not only I’m limited to one charger at a time, only charger 1 and 2 have the needed output port to connect too! Also, the software was provided on an 8cm CD-ROM, which I can’t read in my slot-loading drive! More on this in my next post. This entry was posted by Niobos on 2012-01-15 at 21:48 under RCheli. Tagged charger, review. You can skip to the end and leave a response. Pinging is currently not allowed. Follow any responses to this entry through the RSS 2.0 feed.